The Top 15 Historical Sites in Wisconsin! Wisconsin, which gained its statehood in 1848, has a past well worth uncovering. Did you know the state is home to ancient archeological sites dating to 1000 A.D.? Or that Wisconsin boasts a circus museum labeled an international historic site? Get to know a little more about Wisconsin’s past at these 15 intriguing historical sites. The House on the Rock is not specifically named a historical site in Wisconsin. Although, there is so much history behind it. This tourist attraction in is filled with historic antiques and replicas of history. Visit their quirky collections and life sized sculptures. Cave of the Mounds can be looked at as being one of Wisconsin’s Wonders. This cavern of limestone stalagmites and stalactites was founded accidentally and has become one of the best tourist attractions in Wisconsin. Devil’s Lake State Park is a camping, hiking, and all around attraction to both Wisconsinites and visitors. Spectacular 360 degree views fill this 9,000-acre state park. As history was recorded The Ringling Brothers had a summer home on the Devil’s Lake shore. Located in Pepin Wisconsin, Laura Ingalls Wilder Cabin is a replica of the “Little House in the Big Woods.” Wilder was a famous children’s author who was born in Wisconsin. The cabin is open year-round and has picnic tables, a water pump (which you actually have to pump! ), and restrooms. The National Railroad Museum is located in Green Bay, Wisconsin. Visit their exhibits, take tours, and view their ageless archive and artifact collections. The museum has preserved historical railroad objects as well old photographs of Wisconsin history. The famous brew master—Captain Frederick Pabst constructed a mansion for him and his family in Milwaukee, Wisconsin, in 1892. Him and his wife Maria collected art and timeless treasures. The mansion is now on the list of the National List of Register of Historic Places in 1979. To this day visitors can both rent and visit. Ten Chimneys is located in Genesee Depot, Wisconsin. The museum has a mission to progress the arts, theater arts, and art education. The estate was created by theater Gods Alfred Lunt and Lynn Fontanne. After their death, Ten Chimneys was open to the public. 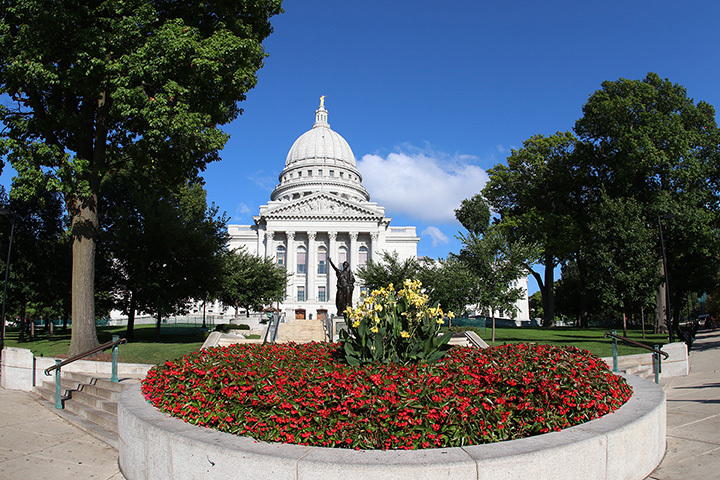 Prior to Madison, Belmont was the first capitol of the Wisconsin territory. In early 1836, lawmakers met in Belmont, Wisconsin, to decide on framework, laws, and legislation of the state. The Van Hise Rock is an upright rock formation that is off Highway 136 in Rock Springs, Wisconsin, in a turnabout. This historic site excessive geological information about metamorphism. The rock itself is named after Charles Van Hise—an American geologist who was born and raised in Wisconsin. Aztalan State Park holds some of Wisconsin’s most prized archeological sites. In 1000-1300 A.D., an early ancient Mississippian village is inside of Aztalan State Park was build. Those who settled in the area built large mounds and a defensive stockade around the area. The Circus World Museum started in the 1959 in Baraboo, Wisconsin. What was once only an acre of land and a few wagons for perform tricks on, is now an internationally-recognized historical site in Wisconsin. Today, the Circus World Museum covers over well over 50 acres with several permanent structures. Travel back to the 19th century by going to Old World Wisconsin in Eagle, Wisconsin. Old World Wisconsin re-creates old farm, homes, gardens, and crafts made in the 1800s. Learn about historic food preparation tactics and view traditional clothing from that period. Located in Mineral Point, Pendarvis is an official historical site in Wisconsin. The 4.5-acre site is home to many 19th century built cabins. These cabins were originally built by Cornish immigrants who settle in the Iowa County area. Not only visit the cabins but visit the museum store for other great trinkets. Find out why Wisconsin Dells became so famous. Famous landscape photographer H.H. Bennett moved to his current studio in 1875 and it is believed that it was the oldest operating photography studio in the U.S. The studio itself houses many of this original photographs, inventions, cameras, and camera equipment.